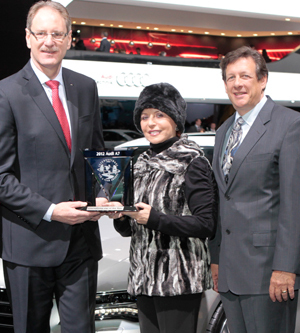 Accepting the ICOTY award for International Car of the Year was Johan de Nysschen, Audi of America president. Add AUDI SPOKESPERSON HERE with quote: ...XXXX of XXXX was all smiles when learning of the honor from Caldwell, to be presented to Audi at Detroit's North American International Auto Show on Monday. And does the A7 deserve it! This is a deliciously designed luxury sports sedan with all the DNA of a well-bred champion. Looks are a high point. It's taut and edgy, with a sloping sweep rearward and short overhangs at front and rear, that highlight the long, low look. It's so perfectly balanced one simply shouldn't notice there's a set of rear doors waiting for two back seat riders. Its coupe nature overrides that little detail. It's when you peel away the exterior packaging that things in the posh interior can become exciting for the techno electronically inclined. The eight-inch display pops up with engine start. Navi and telephone information can be entered with a sort of "handwriting" hand gesture, while WIFI accommodates as many as eight different devices. Real time Google Earth mapping navigation with voice recognition gives broad, precise directions. And available heads up display and infrared night vision that highlights unseen people or pets in the dark ahead helps keep eyes and car on the road. In the comfort equation, leather seating in front gets three stage heating and cooling. There's available heating for rear seats. And if spending extra cash is welcomed, the available, pricey (AKA $6K) Bang & Olufsen advanced sound with 15 speakers can blow your senses along with your wallet to offset the super quiet interior. That punch, of course, comes from its credentials, in this case a 3.0-liter, 310-HP supercharged V-6 powerplant. And the preferred drive can be adjusted for four modes from comfort to dynamic. Like other Audis, the A7 sports Quattro drive, its trade name for all-wheel-drive. Audi states that combined with intelligent brake management (one of its myriad of safety features), it has "seamless neutral cornering." (Translation: It keeps you smoothly planted in curves.) Check out the eight-speed tiptronic trans, but don't look for paddle shifters. Ubiquitous in some other luxury autos, they're missing here. The A7, on requisite premium, earns an 18 city/28 highway rating that averages 22 MPH. That's not so bad for some pretty posh playtime. 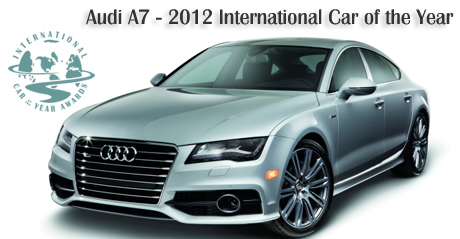 For more info on the Audi A7, click here.